A properly and thoroughly restored 1969 Mustang Boss 302, with its original drive-train, 99% original trim, original glass, original sheet-metal, original and hard to find parts including Emissions equipment, Sport Slats, Rear Deck Lid Spoilers, Magnum 500 road wheels, space saver spare, jack, etc., etc., etc.. Perfectly documented and never offered for public sale, ever, this is a unique opportunity for a Mustang collector to purchase a true investment grade car which will absolutely stand out from the vast sea of restored and over-restored cars. 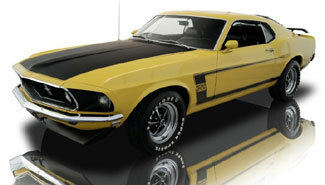 This Boss 302 has never been shown in any public setting and is ready to take the world by storm. New items in the engine bay include: battery; bolt kit; cap and rotor; hoses, belts; spark plug wires, and; coil. So there you have it, a perfectly and properly restored original 1969 Boss 302 engine, nearly 100% correct in every way. And yes, this is the original engine that came in the car, as verified by all numbers. The interior was easy --- we kept it original. That's correct, outside of a headliner replacement (sagging), the Black Kiwi Bucket Seat interior is 100% original, from the carpet, to the dash, to the gauges, to the seats, to the seat-belts, to the shifter and console, to the door panels. Check out the sill plates � those are originals! Guys, if you want to achieve a perfect score at the next MCA National Event for an interior in a 1969 Boss 302, come study this car � it's exactly the way it left the factory 40 years ago.